You Still Have Time to Stress-Bake a Traditional Election Day Cake!!! TECHNICALLY this is an apple cake, but here it is playing the part of an election cake. Not only is America missing out on an election mascot, we don’t even have an amenity available to colonial Americans—great honking slices of cake that often contained booze. Fortunately, you could still remedy this with a little after-work stress baking! Election cake, or Hartford election cake, is a breadlike pastry that was popular in the 18th century. 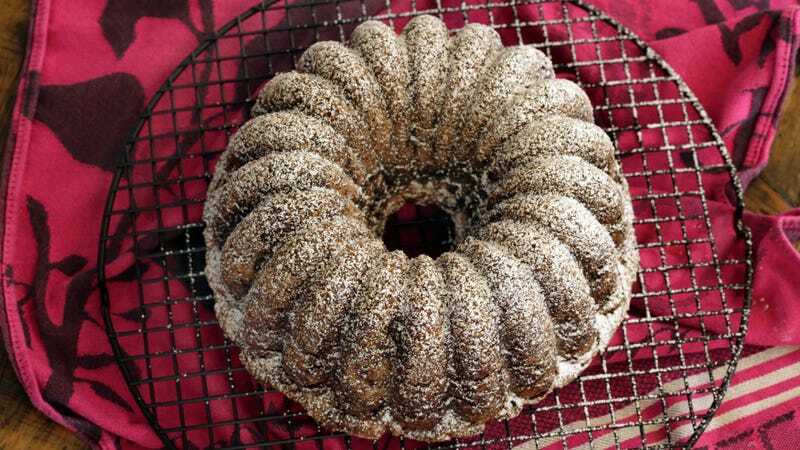 Unlike a modern cake, it is leavened with yeast instead of baking powder or soda, and it is the direct descendant of the English Great Cake, commonly eaten during holidays. Since the Puritans of New England rejected holidays like Christmas, Easter, and May Day—due to the holidays’ pagan or “Romish” associations—they celebrated secular occasions like elections. And a holiday called for a cake. Connecticut in particular was fond of Election Day ragers, as they had the right to elect their own colonial governor, and so communities might make one giant cake for everybody to share. According to a 2016 piece by Bon Appetit, “The first recorded recipe for election cake, written in 1796 by Amelia Simmons in her second edition book American Cookery, called for 30 quarts of flour, ten pounds of butter, 14 pounds of sugar, and heaps of brandy, raisins, and spices.” Sounds great. While it’s disappointing that you aren’t handed a warm, fragrant slice upon leaving the voting booth—although journalist Kim O’Donnel and others have been doing their best—we’ve got a long night ahead of us and it’s not too late to give yourself something to do while you wait. The Culinary Institute of America has a recipe, which uses rapid-rise yeast and calls for cinnamon, nutmeg, cloves, dried fruits, and good, old American whisky. Basically, it sounds like a fruitcake that’s actually delicious, helped along by a glaze on top, or maybe just a particularly spicy coffee cake. This recipe from—of all places—the Old Farmer’s Almanac—also looks pretty good, with a thicker icing and the inclusion of currants. The perfect accompaniment to being glued to your television set and totally unable to choke down anything like real food, out of sheer nerves!